To the legendary Sega Dreamcast, you live on as we cover one of your greatest titles, Power Stone 2. Say what you want to say but Power Stone is another underrated game. Clearly there was a demand for this game since it even has its own anime. If you enjoyed playing Super Smash Bros you will enjoy Power Stone. 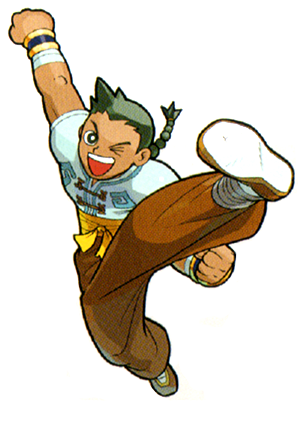 Straight to it, Power Stone 2 was a simple beat em up game. as you collect these “Power Stones” (more like choas emeralds from Sonic the Hedgehog) to utterly own your opponent. When I mean own your opponent I mean showing them they have no hope to make it out alive. And if you did survive you had bragging rights for the rest of the day with your friends. With the picture I’m showing here you know what her’s capable of 😉 and you know exactly what he looks like when he “powers up” or “transforms”. And HOW CAN YOU NOT come to the conclusion when you use his “Ryuugadan” (more like Kamehamehas). Or better yet his “Dairyuudama” (more like the spirit Bomb). Not to mention Dairyuudama is “Big Dragon Ball” in Japanese…. Ok I’ma stop, but anyways how could you not make the conclusion that this is heavily Dragon Ball Z influenced but we don’t care. It’s not to summon the Spirit Bomb especially when you’re about to lose. And epically relive that moment when Goku hits Freeza with the spirit bomb….bad example since Freeza lived but anyways you get my point. If there was a character that grabbed most people (like me) into having a good reason to play this game it is Wang Tang and that’s all there is to say it. Especially if you’re an American and don’t know much about Japanese culture. Ok I’ma get off of Wang Tang so let’s cover the other Power Stone 2 characters shall we? There isn’t much else left to say about this game since it has high replay value especially with your friends. OHHH NOO (leave a comment or like if you heard that narrators voice when you read that just now) I almost forgot, between all the crazy items you could use, the traps to escape in the dungeons and shoot even surviving a 1000+ feet fall using a blasted umbrella. AN UMBRELLA! I may sound a bit over dramatic in this game but thinking back I didn’t really pay attention to all this. It was just fresh, new, exciting, clean action, no blood for those of you who are not a fan of blood and gory type of games. I’m telling this game is very under rated. Even more so since people are still looking for the Power Stone 2 ISO or the Power Stone 2 Rom. Do you feel there are any games today that you think are similar? If so, please name them and I will look into them myelf. What was your favorite character and why? Leave a comment with your greatest memory of Power Stone 2.